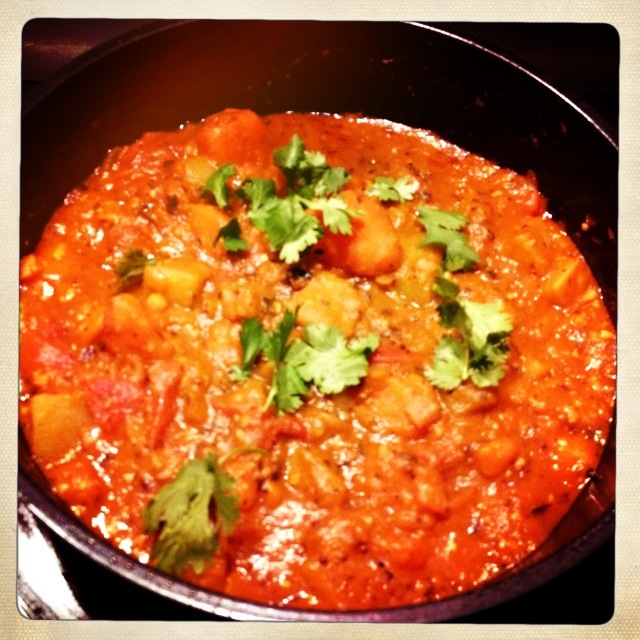 Today I thought I would share a delicious, healthy, Ayurvedic-ish curry recipe I made last week. One of my colleagues brought a bunch of Sweet Potatoes and Choko’s (or Chayote) to work for anyone that wanted them, naturally I took a couple. I try to follow an Ayurvedic diet as much as possible, and curry’s, vegetables and rice figure a lot in the world of Ayurveda, so I came up with this concoction to use my free loot! Sweet Potato is one of those magical comfort foods, despite it being “heavy” it is easily digested, and eliminated due to it’s high fibre content. It pacifies Kapha, and feels light in the stomach whilst still being nourishing. Sweet Potato is full of complex carbohydrates so even though it is light, it keeps you fuller for longer. Plus, good news for diabetics: According to preliminary studies it may help stabilise blood sugar levels. Sweet Potato is used all over the world in a variety of ways, and no wonder, I think everyone has cottoned on to how good this orange, starchy, sweet, creamy vegetable is! Now lets talk about Choko or Chayote, as it’s second name suggests, it is native to South America, but used all over the world. 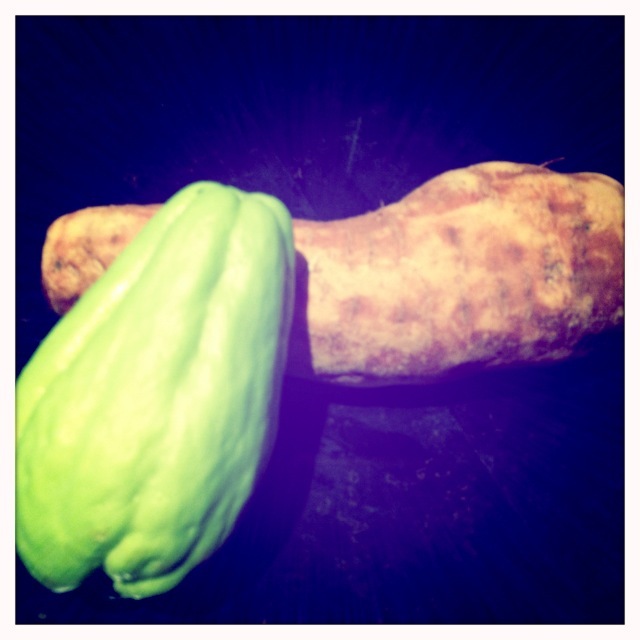 Choko are very versatile and grow like a weed in Australia. I ate lots of them as a child, my Grandmother used to grow them on the side of her chicken pen, she would peel, quarter, steam/boil them, and serve the Choko with a dob of butter and some salt and pepper, simple but delicious! Choko remind me of her, and I think that goes some way to explaining why I love them. Choko can be quite bland, but Dad roasts them with the usual type of Sunday roast veges (potato, pumpkin, carrot, onion etc. ), the flavour they take on is amazing! I feel a little like Bubba from Forest Gump, explaining all the ways you can cook shrimp, but Choko are a surprisingly multitalented fruit. Now back to the Ayurvedic perspective; Choko have a high potassium content and are full of amino acids and Vitamin C, they are classed as quite warming, anti-inflammatory and are excellent for Kapha constitutions, but should be eaten in moderation for Pitta’s – Wah! I’m a split Vata/Pitta. Alright, now I’ve bored you sufficiently with my food geekiness, I’ll give you the recipe. – Heat oil in a pot/fry pan, add the mustard seeds and cook until they start to pop. – Add curry leaves and stir fry for a minute while the flavours infuse into the oil. – Add the onions and sauté until they turn translucent, add the garlic and cook until onions are light golden brown. – Add all the spices and stir to combine, allow the spices to heat through, but not to burn. – Add the Choko, cook stirring frequently for about 5-10 minutes, if the mix is very dry add a little water. – Check the Choko has softened, if it is still firm/hard replace the lid and check again in 5 mins. – Remove lid, allow to simmer, stirring occasionally, until the curry has reached your desired consistency. – Serve onto plate or bowls over the top of fluffy steamed basmati rice, garnish with fresh coriander. I hope you try out this recipe and have fun with it. Don’t be afraid to substitute. Pumpkin & Zucchini would have a similar flavour and would be delicious!